REPLACEMENT CANOPY ONLY. CUSHION NOT INCLUDED. METAL STRUCTURE NOT INCLUDED. This is a replacement canopy for the North Haven Swing. This swing was originallsold at Lowes. Manufacturer's model number: SC-J-100GS; SC-I-126EGS. 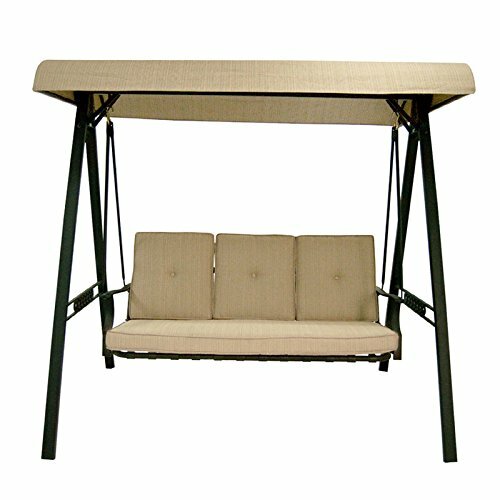 SKU number: 62501 Color: Beige (different from original) Signature indicators: Curved roof design; 3 seat swing. Fabric: UV treated, water resistant, CPAI-84 fire retardant. REPLACEMENT CANOPY ONLY. CUSHION NOT INCLUDED. METAL STRUCTURE NOT INCLUDED. This is a replacement canopy for the North Haven Swing. This swing was originallsold at Lowes. Will not fit any other model! Fabric: UV treated, water resistant, CPAI-84 fire retardant. If you have any questions about this product by Garden Winds, contact us by completing and submitting the form below. If you are looking for a specif part number, please include it with your message.